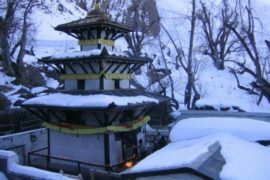 Muktinath Temple is Situated at an altitude of 3,710 meters (12,172 feet) at the base of the Thorong La mountain pass in the Mustang district, Muktinath Temple is a highly venerated sacred place for both Hindus and Buddhists. Hindus call the site Mukti Kshetra, which literally means the “place of salvation” and it is one of the most ancient temples of the God Vishnu and the Vaishnava tradition in Nepal. The shrine is considered to be one of the eight sacred places known as Svayam Vyakta Ksetras (the other seven being Srirangam, Srimushnam, Tirupati, Naimisharanya, Totadri, Pushkar and Badrinath), as well as one of the 108 Divya Desam, or holy places of worship of Lord Vishnu. Additionally, it is also one of the 51 Shakti Pitha goddess sites. The Muktinath temple is small and contains a human-sized golden statue of Vishnu as Shri Mukti Narayana. In addition to Mukti Narayana, the temple has bronze images of Bhoodevi (the Earth-goddess form of Lakshmi), the goddesses Saraswati and Janaki (Sita), Garuda (the mount of Vishnu), Lava-Kusa (the sons of Rama and Sita) and the Sapta Rishis (Seven Sages created by Lord Brahma). There is an old Buddhist monk present in the temple and worship is conducted by Buddhist nuns.